The Wild Hare Farm - Our Journey Toward Manifesting Our Own Eden On Earth: Chagaaaaaa! Once again, projects surmount and the time has shuffled away from me. I've made some space to write today, though, so I'd love to update you beautiful folks on what's been happening around the Farm. To start, one of our rabbit does had babies! There were ten of them, and if Maya has a say in it, they're all named "Rainbow." Also, two of our hens went broody. One of them hatched three chicks out of 7 eggs. One of the eggs was snatched by renegade chickens, two of the others weren't fertilized, and we put one under the second broody hen, who has yet to hatch any of the 6 eggs she is sitting on. We are starting to think that she may not hatch any of them. We have also been working to build a new home space for the rabbits, and have decided to decrease the number of rabbits we have as we are finding that selling the meat as a full-time business would take more time and energy than we are willing to sacrifice at this point in time. For now, the rabbit meat will be consumed by ourselves and any friends/family who wish to try some as well. We're still pleased that we have this sustainable source of food! So what are we working on now? Well I'm glad you asked! (I know... you probably didn't ask, but I'm gonna tell you anyway!) 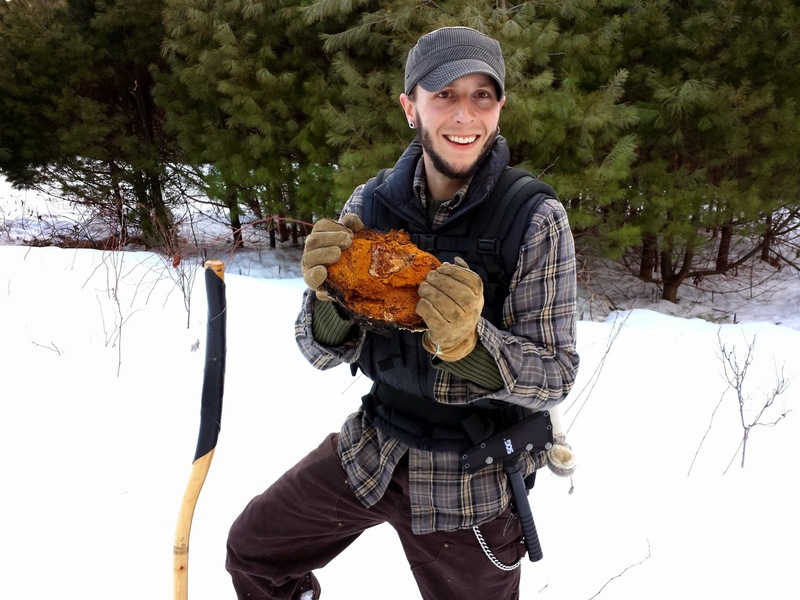 Aside from the new rabbit haven, and planning a new chicken coop (we're going to start raising meat birds as well as layers), our entrepreneurial endeavor has manifested from CHAGA! "What the hell is Chaga?" Again, I'm glad you (maybe) wondered! Chaga is a fungus that grows on Birch trees (and very rarely on Beech, Alder, Hornbeam and Elm). It is the result of parasitic activity from within the Birch tree. The Chaga "tumor" extracts vital nutrients from the tree, and will eventually kill it, though this may take many years. All of the vital nutrients that are extracted remain within the Chaga burl (also called a "conk"), and when harvested, can be used medicinally for humans and animals alike! Chaga (Inonotus Obliquus) is a fungus that is found growing out of the trunks of Birch trees. It appears as a hard, wood-like burl (also called a conk) that is rough and black (due to massive amounts of melanin) on the outside, and smoother and golden-orange on the inside. Composed of 215 phytonutrients, polysaccharides, amino acids, essential minerals, trace minerals, Vitamins B1, B2, B3, D2, and K, Betulin and Betulinic Acid, and Superoxide Dismutase, Chaga has rich medicinal value! "What can Chaga do for you?" 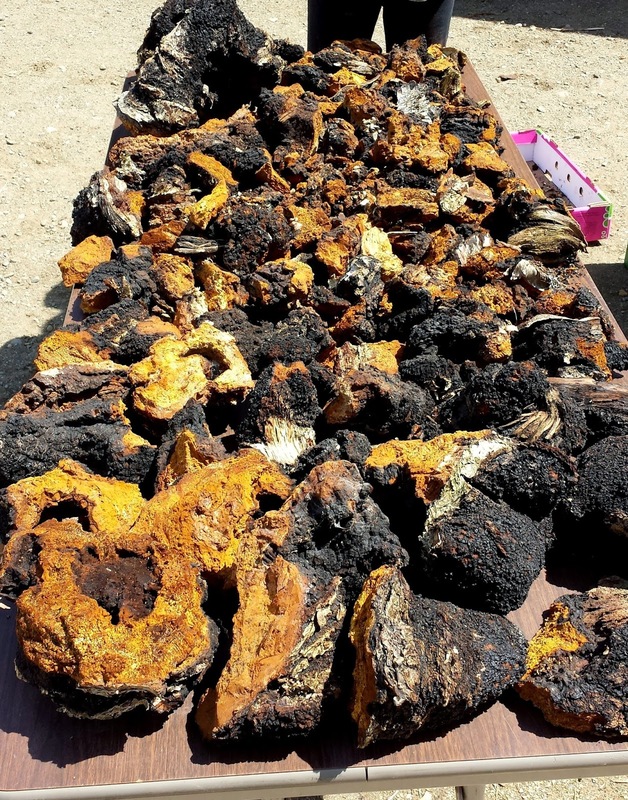 Chaga has been called the "King of Plants," the "Gift from God," and "The Diamond of the Forest," and with good reason: the medicinal properties of this amazing fungus has the capability to treat just about anything! The low pH betulinic acid in Chaga targets cancer cells directly, and has been proven to have anti-tumor effects, is anti-malarial, and anti-inflammatory; Superoxide Dismutase is an antioxidant (with the highest levels of any other food or herb known to date!) which helps to prevent - even reverse - signs of aging cause by freeradical damage; various phytonutrients and polysaccharides help to repair damaged cells, regulate immune system function, and detoxify the body of carcinogens and heavy metals; melanin improves the appearance of skin, hair, and eyes, and enhances one's youthfulness; Vitamin K can reduce the appearance of spider veins and broken capillaries; Triterpenes can improve digestion, assist with liver detoxification, and help in relieving and/or recovering from coughs, chronic bronchitis, asthma, and hepatitis. The list goes on! "How can you use Chaga?" Chaga can be used internally and externally! Use small chunks of Chaga, or grind it into a powder to use as a delicious tea; Chaga soaked in brandy or vodka for a month or more makes a super potent extract; added to topical lotions, body butters, face creams, etc., it can assist in reversing signs of aging, scars, and stretch marks, and can even balance the skin tone. We have been foraging and wild-harvesting Chaga for a couple of years now, and have collected quite a bit (sustainably of course). We have shared it with others who are ill or trying to recover from illness and all have reported wonderful results! 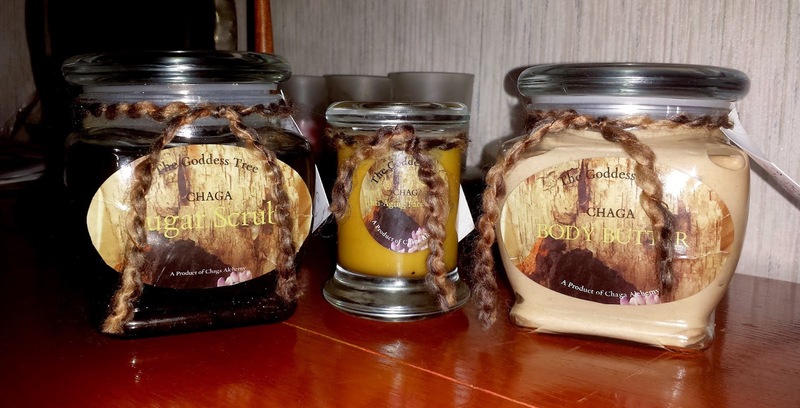 We use it ourselves to help maintain good health, and more recently I have started incorporating Chaga into beauty products that I am creating. My products so far consist of Sugar Scrubs, whipped Body Butters, and Anti-Aging Face Creams. I will eventually be offering salves and lip balms, and possibly tinctures and/or elixirs once we get our kitchen space certified. The aforementioned currently available products are available as custom orders, with a myriad of scent combinations to choose from or concoct! This line is called "The Goddess Tree Body Care Products," and are available (along with our chunked and ground wild-harvested Maine Chaga) at www.etsy.com/shop/ChagaAlchemy. We invite you all to come and check out the shop, give feedback, ask questions, connect with me for a scent consultation, and make a purchase! Well, you can check http://chagaherb.com/tag/chaga-tea/ as well.